4860 Oldbridge Rd, Upper Arlington, Ohio Foreclosure Auction, Sept 5 @ 1pm. 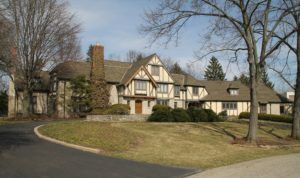 executive to buy property in highly desirable Upper Arlington, Ohio at 50% below the last recorded selling price of $2,850,000. Gryphon Auction Group and auctioneer Richard Kruse have been appointed as Private Selling Officer to offer 4860 Oldbridge Dr., Upper Arlington, Ohio 43220 at an upcoming online only foreclosure auction. This unique 14,000 Sq. Ft. custom built home is reported to have 6 bedrooms, 5 full bathrooms and 2 half baths, a pool, pool house, a 12-14 car showroom / office with loft, wine room and cellar on almost a full acre. The court ordered minimum bid is set at only $1,408,412.60. But here’s the catch. You can’t see the inside until after you close on the transaction. A Private Selling Officer Auction takes the place of the county Sheriff Auction and the rules are the same. Bid on it sight unseen or get creative. The auctioneer can not grant interior access and is not in communication with furniture retail franchisor and Central Ohio businessman, Jeffrey S. Hosking, the current owner. The auction will be conducted entirely online at www.gryphonusa.com. Bidding opens on August 28 at 9:00 am will end at 1:00 pm on Tuesday, September 5, 2017. Broker participation is encouraged. “The Private Selling Officer process was selected because of the marketing and outreach our process provides. We are looking forward to getting this house sold to a new owner” said Auctioneer and Private Selling Officer, Richard Kruse. Additional Central Ohio PSO and Receiver Auctions currently open at 5517 Driftwood Ln, Columbus, OH, 4054 Walnut Crossing, Groveport, OH and 4760 Cleveland Ave., Columbus, OH with another 91 assets in the pipeline. For details about the upcoming auction visit www.gryphonusa.com or call (614) 774-4118. Richard F. Kruse is Managing Partner of Gryphon USA, Ltd. The company oversees a receivership & asset management group, a commercial auction business and, in conjunction with Borror Properties, a full service real estate advisory practice. He is also a founding member of the Ohio Foreclosure Auction Group, a partnership of six senior real estate auctioneers throughout the State of Ohio, specializing in sales of real property in foreclosure proceedings. Richard F. Kruse is Managing Partner of Gryphon USA, Ltd. The company oversees a receivership & asset management group, a commercial auction business and, in conjunction with Borror Properties, a full service real estate advisory practice. Mr. Kruse’s engagements are primarily focused on complex state and federal level legal matters, foreclosure and insolvency. Since 1996, he has acted in the capacity of receiver, interim manager, asset purchaser, liquidating agent, equipment appraiser, broker, property manager and/or auctioneer in transactions throughout the United States, Mexico and Canada – all with combined asset values over $2 billion dollars. In 2003, Mr. Kruse began strategically focusing on regional projects and accepting receivership appointments throughout Ohio, and ever since, has operated and sold or wound-down over 250 corporate entities through negotiated sale and auction. Mr. Kruse routinely teaches seminars on distressed asset management and corporate wind down and is an instructor at The Ohio Auction School. He is frequently consulted as an industry expert by the Columbus Dispatch and Columbus Business First newspapers. In 2011, Mr. Kruse participated in drafting new local rules for receivership management in his home base of Franklin County, Ohio. Most recently, he has been active in promoting and drafting modified legislation language related to streamlining the foreclosure sale process in Ohio. Mr. Kruse is a member of the American Bankruptcy Institute and Turnaround Management Association, where he formerly sat on the board of the Ohio Chapter. He is a member of the National and Ohio Associations of Realtors, and National and Ohio Auctioneers Associations. Mr. Kruse was recognized as “One to Know” in Real Estate 2013 by Business First, and in October of 2013, he was appointed by Governor John Kasich to fill a vacancy on the Ohio Auctioneers Commission. His first full term on the Commission began in late 2014. Mr. Kruse acts as advisor on strategy and finance to political candidates in Central Ohio, and is a graduate of the 2006 Leadership Columbus Program. In his personal life, he is dedicated to causes like education, children and politics. He is an active volunteer, fundraiser and parishioner at CenterPoint Church Gahanna where he participates in many hospitality functions and youth program. When he’s not working, he enjoys traveling and cooking. Mr. Kruse and his wife, Melissa, have one daughter, Savannah, and live in a northern suburb of Columbus, Ohio.